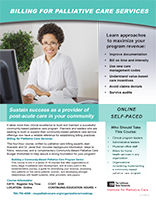 This is the eighth course in the 11-part series of Building a Community-Based Palliative Care Program. You can take this single course or the entire series. Billing fee-for-service to Medicare for palliative care is relatively new, so many organizations are unaware of the opportunities that exist to enhance their program’s revenue. Are you maximizing your palliative care program’s billing capacity? Do you know how to bill for advance care planning, chronic care management, and transitional care? Click HERE to download the brochure on this course. Palliative care billing experts Jean Acevedo, LHRM, CPC, CHC, CENTC, and Janet Bull, MD, FAAHPM provide an in-depth review of opportunities to bill Medicare for the provision of community-based palliative care. The course features specific information to help your practitioners and coding specialists correctly document and bill for the services you provide. 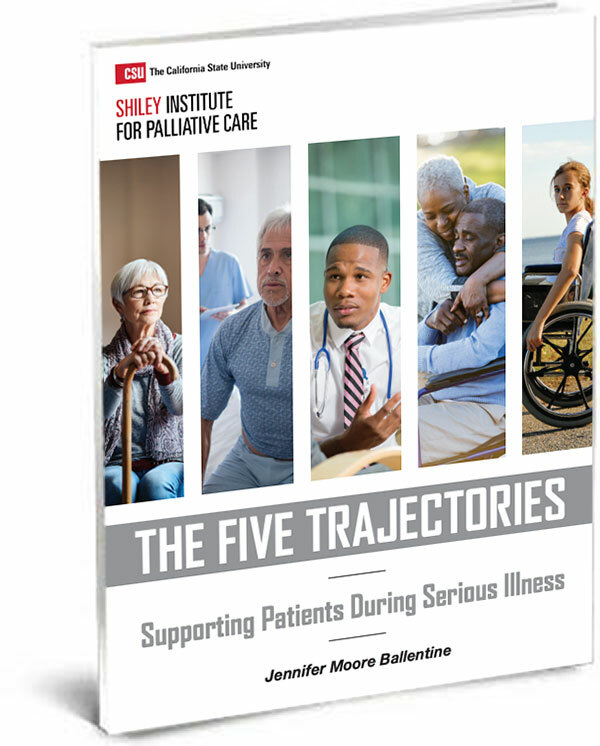 In addition, the course includes a downloadable spreadsheet demonstrating how budget for palliative care provided in patient homes, physician offices, and skilled care facilities. Click here to join the interest list! The Doctors Company designates this activity for a maximum of 4 AMA PRA Category 1 Credits™. Physicians should claim only the credit commensurate with the extent of their participation in the activity. Creating a sustainable community-based palliative care program requires a deliberate approach to budgeting and billing. Regulatory concerns and evolving billing requirements make palliative care billing a daunting and complicated endeavor. For many organizations, developing a billing strategy and realistic budget are the hardest aspects of developing a program. Participants in this self-paced online course will learn the how to bill fee-for-service and time-based billing Medicare, coding, new care management codes, how to prevent billing denials and audits and much more. Billing for Palliative Care Services is delivered in four separate modules, as described below. Each module includes detailed information and resources, teaching you strategies to maximize your palliative care billing and comply with applicable regulations. * Every course registrant will receive a free downloadable Excel template to help programs accurately budget and closely monitor program costs. Jean Acevedo, LHRM, CPC, CHC, CENTC Jean Acevedo, LHRM, CPC, CHC, CENTC has over 30 years of health care experience. She has a particular expertise in chart audits, compliance and education relative to physician documentation and coding. Jean has also been an expert witness in civil litigations and an investigative consultant for the DOJ and FBI in Federal fraud cases. Jean has demonstrated particular expertise in therapy and rehabilitation documentation and coding and is well known for her knowledge of hospice and palliative care physician services billing. Recognizing physician reimbursement is moving from a pure “fee for service” model to one reimbursing for quality and value, she is helping ACOs and their physicians understand the rules and nuances of diagnosis coding and the impact on Medicare Risk Adjustment (MRA) coding. She is a workshop presenter for the AAPC and co-author of the Academy’s Compliance Toolkit. She is a co-author of the article “Top 10 Inpatient Palliative Medicine Billing and Coding Mistakes (and How to Fix Them This Week),” published in the Journal of Palliative Medicine, Volume 18, Number 3, 2015; and her article, “Value-based Payment Modifier: Quality vs. Cost,” was published in Healthcare Business Monthly, February 1, 2015. Jean is an instructor at Florida Atlantic University where she teaches the regulatory compliance modules of FAU’s Certificate in Medical Business Management program, and a member of several Coding Institute Editorial Advisory Boards. Jean has been a Participant in CMS’ Medicare Provider Feedback Group, CMS Division of Provider Information Planning and Development since 2007 and is a member of the Jurisdiction 9 MAC’s Provider Outreach and Education Advisory Group. She is a frequently sought after speaker as she possesses the unique perspective of avoiding risk and liability while optimizing reimbursement in the highly regulated health care industry. Janet Bull, MD FAAHPM Janet Bull is the Chief Medical Officer at Four Seasons and holds a consultant assistant professorship in the internal medicine department at Duke University Medical Center. She is a Fellow of the American Academy of Hospice and Palliative Medicine (AAHPM), board certified in hospice and palliative medicine as well as holds a hospice medical director certification. Dr. Bull’s past positions included Advisor to the Hospice Intermediary Advisory Committee, Chair of the AAHPM Research Committee as well as Chair of the Chief Medical Officers group of the National Hospice Work Group. She co-directed the Hospice Medical Directors Course in 2013 and 2014 and has served on its faculty for numerous years, She participates as a Senior Medical Advisor for Aspire Healthcare and sits on the steering committee of the Palliative Care Cooperative Group and chairs the Membership Committee. She is President Elect for The Academy of Hospice and Palliative Medicine and serves on the Executive Board. Dr. Bull has been an Associate Editor of PC-FACS since 2008, and has authored or coauthored several papers on palliative care and quality data reporting, and billing and coding. She directs the research department at Four Seasons and has served as the Principle Investigator on over 45 clinical trials in hospice and palliative medicine. She is Program Director of the Palliative Care Immersion Course and directs Four Seasons’ Center of Excellence, which offers consulting services in hospice, palliative care, and research.